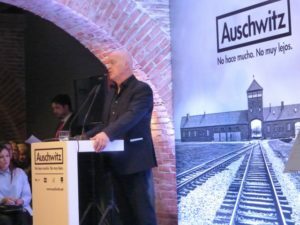 I have just returned from Madrid, Spain, where I attended the premiere of an extraordinary exhibition on Auschwitz, entitled, “Not So Long Ago, Not So Far Away;” an exhibit that will travel the next seven years throughout the world. After its initial six month run in Spain, it will move to Sweden. Why was I there? 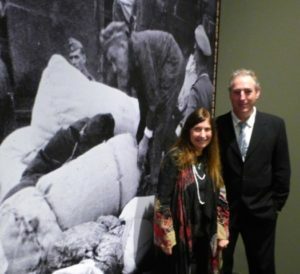 Because the organizers, Miriam Greenbaum and Robert Jan van Pelt, renowned Auschwitz scholars, believed the photos featured in our ‘Last Album’ exhibit, book and film must be included in their exhibit. It was a great honor, but I had no idea how great until I arrived in Madrid. Emerging from the metro at the museum, my friend, Dr. Emilie Passow, and I saw a huge water tower that dominated the landscape. 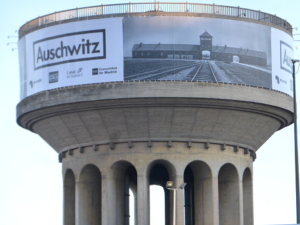 On it was the word “Auschwitz’, with its iconic view. That was our first clue of how major an event this exhibition indeed was! 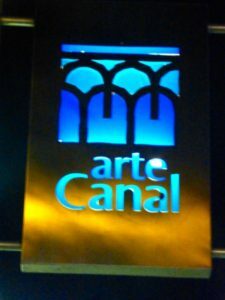 Then we arrived at the Museum Arte Canal for the private premiere (public premiere took place the following day). We met fascinating guests, including foreign ambassadors, international luminaries, and I was happy to renew ties with a few old friends. Introductory speeches gave a hint of what was to come. 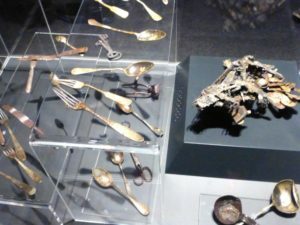 Over 600 objects, many of which have never been seen outside of the confines of Auschwitz-Birkenau, are on exhibit in this mammoth exhibition, which will travel to a dozen cities in Europe, Asia and across America. 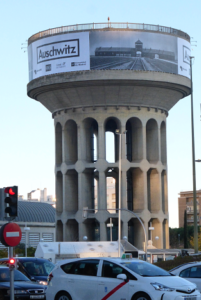 Luis Ferreiro, head of MUSEALIA, the Spanish company which created and sponsored the exhibition, affirms “It’s very important that Auschwitz gets out into the world.” Luis is from San Sebastion, a small fishing village in Basque Spain. 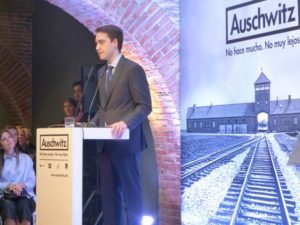 His pivotal involvement with this project is both tragic and life affirming: when grieving the sudden death of his brother, only in his 20’s, Luis found great meaning, and comfort, in the words of Auschwitz survivor, Viktor Frankl. 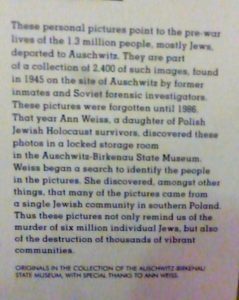 Frankl’s landmark work, Man’s Search for Meaning, helped Luis find a way to honor his brother’s memory, and from grief came the genesis of this Auschwitz exhibition. The principal architect of this monumental Auschwitz exhibition is Dutch Holocaust scholar, and architect, Robert Jan van Pelt. On this evening, Robert Jan, together with Michael Berenbaum, gave guests a deeply moving, highly personalized tour of the exhibit. 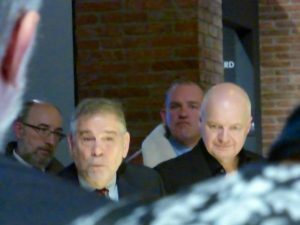 Robert Jan van Pelt explaining the creation and scope of the ‘Auschwitz: Not So Long Ago, Not So Far Away’ exhibition..
Michael Berenbaum (left front) and Robert Jan van Pelt (right front) giving a tour, in tandem, with visitors all around. 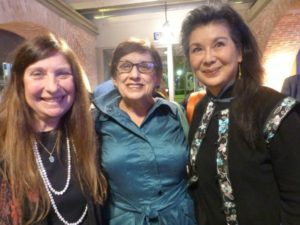 One of the most surprising, and wonderful, parts of the evening was meeting the daughter of Dr. Feng Shan Ho, known as the “Chinese Schindler.” Until a few years ago, no one knew of the courageous efforts of this Chinese Consul General in Vienna from 1938-1940—not even his daughter, Manli Ho! He saved (exact number is unknown) possibly thousands of Jews, and even defied his superior who ordered him to stop. It was very touching to see the current Austrian Ambassador speaking to the daughter of a previous Austrian Ambassador. For further information on Ho Feng Shan, please see articles in China Daily ( Ho Feng Shan: A man of compassion, courage|In Depth|China Daily, Yad Vashem ( Feng-Shan Ho ) and CNN. 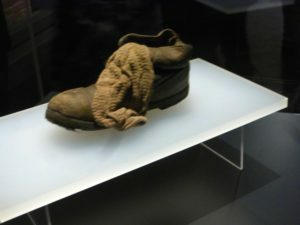 This child’s shoe and sock has become the symbol of the whole Auschwitz exhibition—a common everyday object to personalize the enormity of the Holocaust: one child’s shoe. 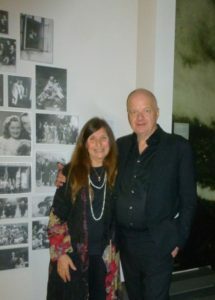 Ann and Paul, Education Director (formerly at the Imperial War Museum).